Cream together the butter and creamy cheese until completely smooth. It will be light and fluffy. Add the peanut butter and vanilla. Mix until well blended. Add the confectioner's sugar 1/2 cup at a time and mix until completely blended between each addition. Mix well. Roll a tablespoon amount of mixture into smooth balls then shape into eggs. Place on a wax paper or parchment paper lined cookie sheet. Chill in the refrigerator for at least 4 hours. Melt chocolate chips and shortening in a bowl over a pot of simmering water. When the chocolate is completely melted, remove from heat and beginning dipping peanut butter eggs. Drop the eggs in one at a time and lift out using two forks. Keep dipping until all the peanut butter eggs are covered. Decorate with sprinkles as you go if desired. Store covered in the refrigerator. Makes 3 1/2 dozen eggs. These muffins are a family favorite at my house. I used to make muffins all the time before I had to go gluten free. After my diagnosis, we had a muffin famine for a while. My kids asked for muffins numerous times but I had read so many horror stories about gluten free baking that resulted in "hockey puck"-like creations that I was scared to dive into gluten free baking from scratch. I tried some gluten free baking mixes but they just didn't cut it. They didn't taste like the muffins we remembered so fondly. Finally I decided that I just had to go for it and try my hand at making my own muffins. And after a couple of tries and tweaks, this recipe is what I came up with. These muffins taste just like the ones we remembered. Success! I was happy and my kids and husband were thrilled! Preheat oven to 350 degrees F. Line muffin pan with paper liners or spray the muffin tins with cooking spray. If you use paper liners, be sure to spray the paper liners with cooking spray too or else the muffins will stick to the muffin paper. Place bananas in a large mixing bowl. Beat bananas on medium to medium high speed until bananas are completely smashed. Add the sugar, vanilla, egg, milk and oil. Mix on medium speed until completely combined. Add the dry ingredients and mix on low speed just until combined. Add the chopped walnuts and chocolate chips and fold in. Scoop out the batter and fill the muffin cups about two-thirds full. Bake for 18-22 minutes or until a toothpick inserted comes out mostly clean with only a few crumbs on the toothpick. Makes about 18-24 regular size muffins. Store in an airtight container in the refrigerator. These muffins reheat nicely and make for a quick breakfast or a healthy afternoon snack. Can you believe that Thanksgiving is next Thursday already?! Time is just flying by! Since starting my full time job as a registered nurse, there hasn't been a whole lot of cooking going on and even less time experimenting in the kitchen. :( I love my job, but I wish there were more hours in the day to do other things that I love too. I have been looking ahead to Thanksgiving and planning what I want to make. And I'm getting really excited about the holiday, especially because of something new we are starting this year. We are fortunately to live near our families and to have all of our family members with us. And we get to spend every Thanksgiving with one or both of our families, which is wonderful! But we have been wanting to create some of our own traditions without giving up spending the holiday with extended family. So this year we are trying something new. The Sunday before Thanksgiving we are calling "Thanksgiving for 4". This will be our family's special day to spend the whole day together celebrating Thanksgiving. My husband and I are going to cook a special dinner. He and I are looking forward to spending some time together in the kitchen because we love to cook with each other and it has been a long time since we got to do that. Also, we are going to spend the day doing all the things the four of us love to do together, as well as spending some time focusing on Thanksgiving and being thankful. I think it is going to be a great day and we are all really excited about it! So, in honor of Thanksgiving, I will be (re)sharing some of my favorite gluten free recipes that I have created over the last couple of years. The first one I want to share is my recipe for Mini Pumpkin Cheesecakes. These little cheesecakes are one of my all-time favorites. So easy to make and so tasty! (The link to the original post about them is here.) This dessert is a great gluten free addition to your holiday meal. Enjoy! In a small bowl, combine the graham cracker crumbs, sugar, salt and butter until all the crumbs are moistened. Line muffin tins with muffin paper and spray them with cooking spray. Then scoop the crumbs into the liners, 1 tbsp. into each muffin liner. Then with the back of the tablespoon, press the crumbs firmly into the bottom of the liners. Bake the crusts at 325ºF for 8 minutes. Place the cream cheese in a large bowl and blend until smooth. Scrape down the sides of the bowl while mixing. Then add the pumpkin, maple syrup, vanilla and spice. Blend all together until the ingredients are completely combined. Add the slightly beaten eggs and mix in just until they are incorporated. Do not overmix! Pour the batter into a liquid measuring cup to make the pouring easier. Then pour the batter into the prepared crust in the muffin tins. Pour the batter up to almost the very top of the muffin liners. Then place in a preheated 325°F oven and bake for 30-35 minutes or until the center of the cheesecakes are set and jiggle slightly when the pan is gently shaken. As I mention in my post "Summer Reset- Day 6", my husband has been making and drink these green smoothies for several months now, but it has taken me longer to get on board with them. I'm partial to my fruit smoothies. I finally tasted the smoothie again because it really is a great way to get a healthy serving of kale to start the day with. I was pleasantly surprised by how good the smoothie was. It really is a great way to start the day with a pile of greens. Sometimes he will switch out a pear for the pineapple or add spinach in place of some of the kale, but most often he makes it as it is listed below. He often includes a banana too. I leave the banana out so it isn't as thick as his is. Besides the thicker texture, the banana complements the other flavors nicely. The ingredients are listed with estimated amounts because it really is something that you can tweak to adjust to your taste from day to day. So without further ado, here is my husband's Green Smoothie. Blend all the ingredients until completely smooth. Then add 5 cubes of ice if you wish to make the smoothie extra cold. I prefer it very cold. Makes one 12-14 oz serving. Before I tell you how to make this wonderful icy drink, there is a backstory. Until a few weeks ago I never drank coffee. I tried it a couple times and didn't like the taste. I always loved the smell of coffee, just not the taste. Now, my husband LOVES coffee! And he has tried to convert me numerous times to the dark side with no avail. He thought that when we had our kids and I was lacking sleep when they were infants that I would start drinking coffee. Nope! Then he thought surely when I was in nursing school and staying up late studying and still getting up early to get the kids ready for school that I would start. Nope! Instead it was one random day I tried it again and discovered that I actually like it now. Who would've thought?! And just in time for me to start working 3rd shift as a RN too. :D One morning this week he asked if I wanted a cup before he took the rest to work. I said "Sure!" But then I decided to exercise first since the kids were still asleep and by the time I was done with my Tone It Up videos I was quite warm and not interested in a hot drink anymore. That's when I thought up this recipe. I knew that chocolate, PB and banana taste awesome together and I had already discovered in my short time of drinking coffee how amazing chocolate and coffee are together. So I decided to try mixing them all together. I added a scoop of hemp protein powder too for an added protein boost. The result is an icy and tasty beverage. Perfect for the hot summer mornings! I am so happy with how the gluten free version of these Christmas favorites turned out! I start my recipe with an all natural peanut butter, which gives the cookie a really good peanutty flavor. Then I sweeten them with honey. PB, honey and butter! You cannot go wrong with that combo. :) To that, I add an egg, a little vanilla and the dry ingredients. Roll the dough balls in sugar and bake. Then top off the warm out of the oven cookies with kiss candies and you have a delicious traditional holiday cookie, minus the gluten! Preheat oven to 350°F. Cream butter and peanut butter together until smooth and creamy. Add honey, baking powder and baking soda and blend together completely. Add the egg and vanilla and mix together. Finally, add the flour, cornstarch and xanthan gum and mix just until combined. Scoop out cookie dough, about 1 tablespoonful at a time and roll into a tight ball. Then roll the cookie dough balls in granulated sugar and place on baking sheet. Bake for 7-8 minutes until the cookies are set and light golden brown on the bottoms. Remove the baked cookies from the oven and top with dark chocolate kisses, pressing the kisses down lightly into the cookie. The pressure will slightly crack the cookies, but that's what you want. Let them sit on the cookie sheet for a couple of minutes then move to a cooling rack to finish cooling. Store in an airtight container. These cookies also freeze really well. I like to bake a batch and freeze half of them to eat later in the Christmas season. After creating a gluten free pie crust last month, I was excited to make Pumpkin Pie this year for Thanksgiving. After not having any pie last year, I was quite excited to be able to eat pie again this holiday. And that was still the plan until about 5 days ago. But then I thought about how delicious a Pumpkin Cheesecake would be! And once I thought of cheesecake, I wasn't as excited about pie anymore. But now I had to quickly create a new gluten free dessert recipe. I decided to go for it and hope that it would turn out as well in reality as I imagined. So yesterday morning I jumped on creating and baking this dessert in time for an extended family Thanksgiving dinner yesterday at noon. I'll admit that I was taking a risk and cutting it close on time. But I figured that if it was a total disaster then I would just scrape the whole thing and no one would be the wiser since I hadn't told anyone that I was bringing dessert. And let me just say that I am so happy that I went for it. These little cheesecakes are tasty! I used gluten free graham crackers for the crust. To sweeten the crust, I used a little brown sugar instead of the traditional granulated sugar. Then for the filling, I used organic Neuchâtel cheese, organic canned pumpkin (from a can that is BPA free), maple syrup to sweeten it and pumpkin pie spice. You could use individual spices, like cinnamon, nutmeg, ect. But I had a container of pumpkin pie spice so I used that. I chose pure maple syrup to sweet the dessert because maple is a delicious, slightly healthier sugar option than granulated or brown sugar. Pure maple syrup has additional nutrients that sugar doesn't have. I like to use Neuchâtel cheese because it is 1/3 less fat than regular cream cheese and an easy substitution in baking. I used a 15 oz. can of pumpkin and only 16 oz. of cream cheese. Most recipes that use that much pumpkin also use more cream cheese. I really wanted to see if I could make the cheesecake with only 2 containers of cream cheese for two reasons. First, it is less cost and less cheese. And second, it's has more pumpkin in each serving. Pumpkins are a wonderful healthy addition to one's diet in the fall and winter months. So I really wanted more pumpkin in the dessert. The result is a cream pumpkin flavor, not as distinct of a cream cheese flavor and not as strong as a pumpkin pie flavor. I am really happy with the results. The only thing that I will do different when I make them next time is to gently mix in the eggs properly at the end. As I said, I was in a hurry and I dumped in the whole eggs at the end of mixing all the other ingredients together and quickly blended it together on a medium speed with my mixer. Which is why when they were baking, they puffed up like little cupcakes and then promptly deflated while they cooled. That'll happen when you beat air into your cheesecake batter. ;) So make sure when you are making yours that you blend the cream cheese until smooth (that will be the longest step). Then add the remaining ingredients, except the eggs, and blend until completely combined. Take the time to scrap down the sides of the bowl so that you can blend it all together without blending longer than necessary. Then beat the eggs slightly in a small bowl, add to the batter and blend on a low speed just until the eggs are incorporated. Do it this way and you should have nice even and level topped cheesecakes. Cinnamon rolls are a food that I thought I would never be able to eat again. Honestly, I wasn't sure how a gluten-free version of cinnamon rolls would taste because this is a food that depends so much on the taste of the sweet bread. I was not sure that could be translated into a gluten-free version. Imagine my surprise and delight when I attempted to make them gluten-free and it was a success! It took a couple of tweaks to the recipe to get it right, but now I am happy with the end result and I am super excited to share this with you! I included lots of step-by-step pictures with this recipe because making cinnamon rolls was something that seemed a bit daunting to me when I was a newer baker. So I decided to included lots of pictures in hope that you all can see how unintimidating it truly is to make these. So without further ado, I present Gluten Free Cinnamon Rolls, just in time for cold weather and winter holidays! Please share this with all your gluten-free friends. Just because we can't eat gluten, doesn't mean that we can't indulge in a warm cinnamon roll with a cup of hot cocoa every now and then. :) And as always, let me know in the comments if you need any clarification or help with the recipe. Enjoy!! 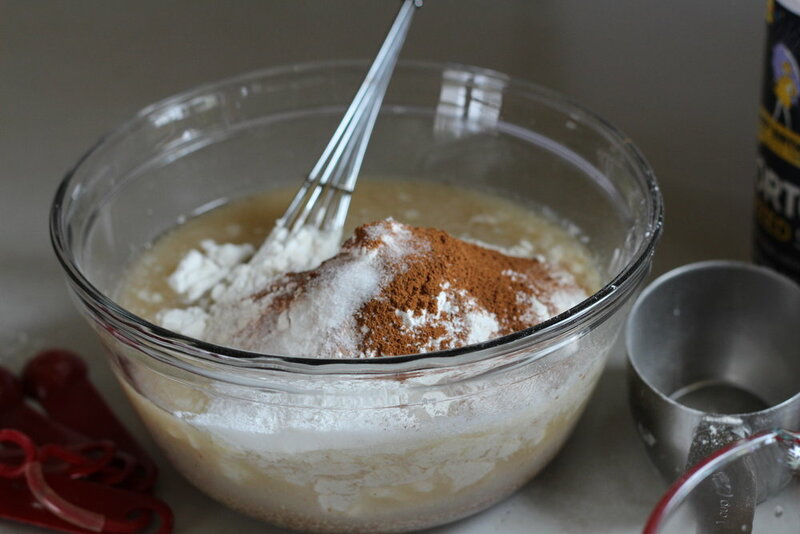 Add sugar and yeast to the warm water in a small bowl. Let sit for 5 minutes in a warm, draft free place. 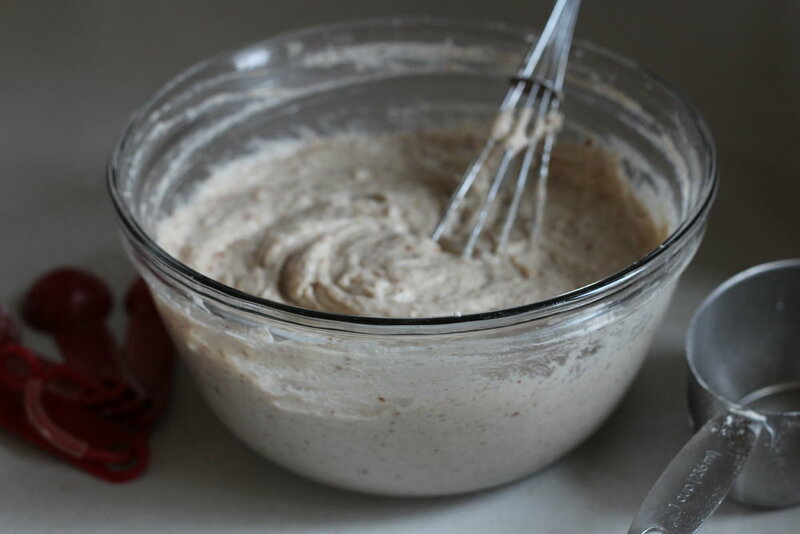 Cream together in a large mixing bowl. Add to butter mixture and blend well. Then add the yeast and water mixture and blend together. Mix dry ingredients into the wet. Mix until blended together. Don't over mix; mix just until it is all combined. Dough should be stiff and slightly sticky; use just enough of the flour so that the dough is only slightly sticky, kind of like cookie dough. It shouldn't be too sticky or too dry. Place a piece of wax paper on the counter and dust with brown rice flour. Turn out dough onto wax paper. Pat together into a tight ball. Push out the dough into a flat disc with your hands. Then flour a rolling pin and roll the dough flat. Roll it out to a 12x20 rectangle. The dough will be about 1/4 inch thick. Pour the butter over the middle of the dough and spread around with a spoon. Then mix together the sugar and cinnamon in a small bowl and sprinkle all over the butter on the dough. Roll up the dough at one of the short ends. If you have one side of the rectangle that is straighter, roll toward that end because a straight end will seal the roll together nicer than a jagged end. Roll the dough up tightly, slightly pressing the roll together as you roll. Cut the dough into 1 inch pieces. Use the length on your index finger from the end of your finger to the line at the first knuckle. This will ensure that all your pieces are the same size and will bake evenly. Spray pans with cooking spray. Place rolls in a 9x13 pan and another smaller pan. Cover and place in a warm place and let the rolls rise for about 40 minutes. Preheat oven to 350 degrees F and bake the rolls for 20-25 minutes until slightly brown around the edges. Cool for about 10 minutes then top with icing. Stir until smooth. Spoon over the warm (not hot) rolls. Delicious on a cold day with a cup of hot cocoa! Awhile back I posted a review for King Arthur's Flour Gluten Free Pancake mix and I said how much my family and I loved the mix. And that is still true; it is a delicious pancake mix! But I wanted to be able to make my own "from scratch" pancakes, like I used to make before having to go gluten-free. So after much experimenting and after more than a few duds, which my supportive husband and kids ate (at least most of them, there were a few that even the dog didn't want to eat). :D Finally, I came up with this version of the recipe and it has been a hit ever since. Whew! And do you know what is the best thing about this recipe? It doesn't take any longer to make these than it does to make pancakes from a mix. At last, quick and tasty from scratch pancakes again! I hope your family enjoys these gluten-free, dairy free pancakes as much as mine does. Combine all the dry ingredients in a large bowl; whisk to mix. Add the wet ingredients and whisk just until combined. There will be a few lumps still. That's okay; you don't want to overmix your pancake batter or else you will end up with tough pancakes. That is true for any kind of pancakes. Let the batter rest for about 5 minutes while you heat your griddle to 350 degree F.
Once the griddle is hot, lightly spray it with cooking spray and pour on the batter. Use 1/4 cup measuring cup to scoop out the batter. This will give you uniform, medium-sized pancakes. Cook the pancakes until the tops are slightly set with a few bubbles rising to the top and the edges are cooked; then flip to second side. This takes about 4 minutes. Cook on second side until the edges are completely set and the bottom is golden brown. This takes about 3 minutes. The top will spring back when lightly pressed with your finger when the pancakes are done. Try to flip your pancakes only once. Overhandling pancakes will make them tough also. Top with warm maple syrup and enjoy! We love to make these into blueberry or chocolate chip pancakes too. To make these variation, make the pancake batter according to the recipe. Then after you pour the batter onto the griddle, sprinkle blueberries or chocolate chips on pancakes. Then continue to cook the pancakes according to the recipe. The chocolate chip pancakes will take the same amount to time to cook, but the blueberry pancakes will take a little longer, especially if you are using cold or frozen blueberries. You are still looking for the same signs of doneness; however, it will take a bit longer. But it is SO worth it!! Blueberry pancakes are my personal favorite! Today was a pretty rough day, at least the first half. I am almost 3 weeks into the first semester of the second year of nursing school and the pressure has been mounting and mounting. The instructors have made it clear that they expect a lot from us, from now until the end. We are going to be taking on more responsibility and more of a leadership role in clinicals. Talk about stress! Along with this pressure and stress came fear and anxiety. Fear and anxiety that I'm not going to do as well as I expect myself to do, that I might fail, that I might not ever figure out where I fit when I graduate, as well as a whole bunch of other little fears. All of this had been building for some time and it all finally came tumbling out of me this morning. I am so thankful that I have a husband who listens to my fears, rational and irrational, sympathizes with me, supports me, and helps me to see things with my cognitive mind when my emotional mind has taken over. After a long talk and a lot of tears, I felt so much better. It was like someone released a pressure valve on me. It helps to be honest and say the things out loud that we are afraid of or stressed about. Oftentimes when we say them out loud, it gives our cognitive mind a chance to respond and helps us see when our thoughts are irrational or fear-based. When we keep all of it inside ourselves, the emotions keep churning and we continue to respond to all our emotion-driven thoughts as if they were all true. So after getting everything out in our talk, I decided to take a shower before I started studying. By the way, why is it that the hot water always runs out right when I am about to start shaving my last leg? And it never gets gradually cooler; no, it seems to go straight to ice-cold. Brr!! :) Anyways, after my shower I decided to bake some cookies before I studied for the rest of the afternoon. The kids had been asking me to bake something all week, so I decided to take a little time and do it today. Since I made the switch to gluten-free in July, 2012, I haven't made a GF chocolate chip cookie that I have been completely happy with. I've made a few recipes, a couple of box mixes, tried different flour mixes, different flour combos, and I had yet to find a chocolate chip cookie that I was completely in love with. I've made a few that were good, but they still tasted like GF cookies. So I decided to do a quick search and see if I could find a good recipe. Lo and behold I found a GF chocolate chip cookie recipe by Alton Brown from 2007! Alton Brown has a great understanding of food and the science behind it. He is my go-to chef when I am looking for a recipe. I have never made a recipe of his that didn't turn out well or that I didn't like. You can get the recipe by clicking on the link here: Alton Brown's "The Chewy Gluten Free" from foodnetwork.com. 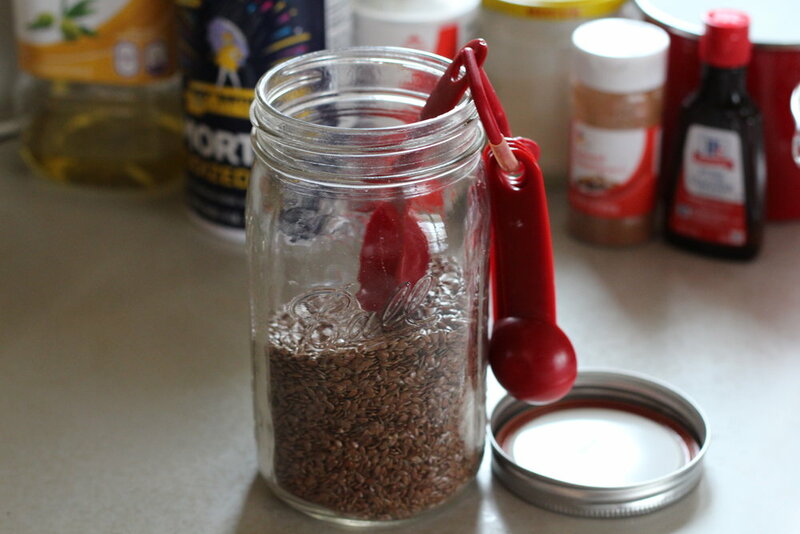 A couple of weeks ago, someone I follow on Twitter posted a recipe for teff. I had no idea what teff was so I googled it. Teff is an ancient grain from Ethiopia. It is the smallest whole grain in the world. And this tiny grain is packed with nutrients. In one serving, which is only a 1/4 cup, there are 180 calories, 1 gram of fat, 4 grams of fiber, 7 grams of protein, 10% of calcium, and 20% of iron. That's a lot of good things packed into a tiny grain! 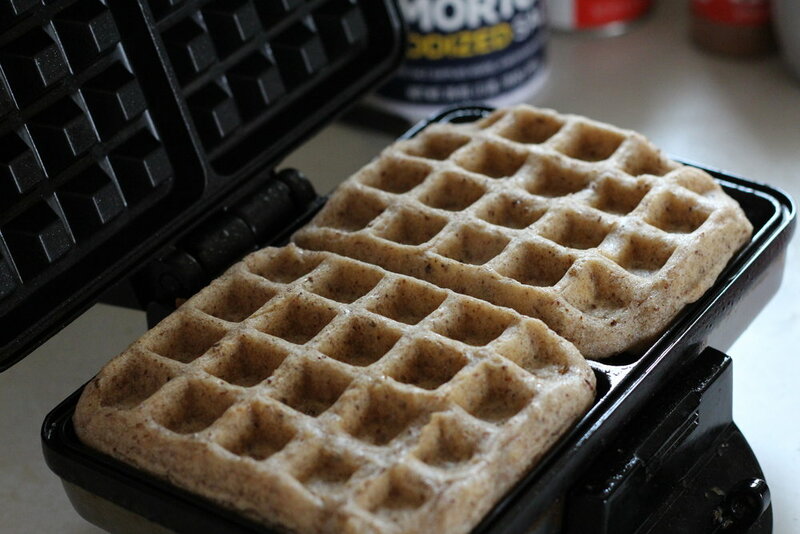 After I read about what teff was, I decided that I wanted to try it. I saw that Bob's Red Mill sold the product on Amazon. I tweeted that I was excited to try this new grain that I just learned about. Someone from Bob's Red Mill saw my tweet and contacted me, saying that they would love to provide me with a sample. I was so surprised by their kind offer and quickly accepted it. A couple of days later my package arrived. The good folks at Bob's Red Mill sent me a full sized package of teff to sample, as well as a bag of their gluten free muesli! Imagine my delight! I opened the bag of muesli right away and tasted some. It was delicious. There is a recipe for muesli cookies on the side of the bag that I'm excited about trying. I'm hoping to make some this weekend. I'll be sure to let you know how they turn out. I made a serving of teff for breakfast. I had no idea what it was going to taste like. It had distinct aroma while it was simmering on top of the stove. Based on that, I thought that the teff would have a strong flavor, but it doesn't. Teff is actually very mild flavored. After tasting a few bites plain, I followed the directions on the bag and sweetened my bowl with a little honey. I also stirred in raisins and sliced almonds for the dried fruit and nuts that it suggested. It was delicious! While I was eating, it kept reminding me of something that I couldn't place. Finally I realized what it was, it reminded me of cream of wheat. The mild flavor and the texture are very similar to cream of wheat, which of course I can't eat anymore because it contains gluten. Now I have a gluten free replacement for cream of wheat- a warm bowl of teff! Whether you can eat gluten or not, I encourage you to try this mild flavored whole grain. It is quick and easy to prepare, just bring it to a boil on top of the stove then simmer until the water is absorb. It is a warm and nutritious breakfast option for cold winter mornings. I would love to hear what you think about it. Let me know in the comments section if you have ever heard of this whole grain and if you have ever tried it or want to try it. Cream the butter and sugar together until fluffy. Add the vanilla and eggs; beat until combined and fluffy. 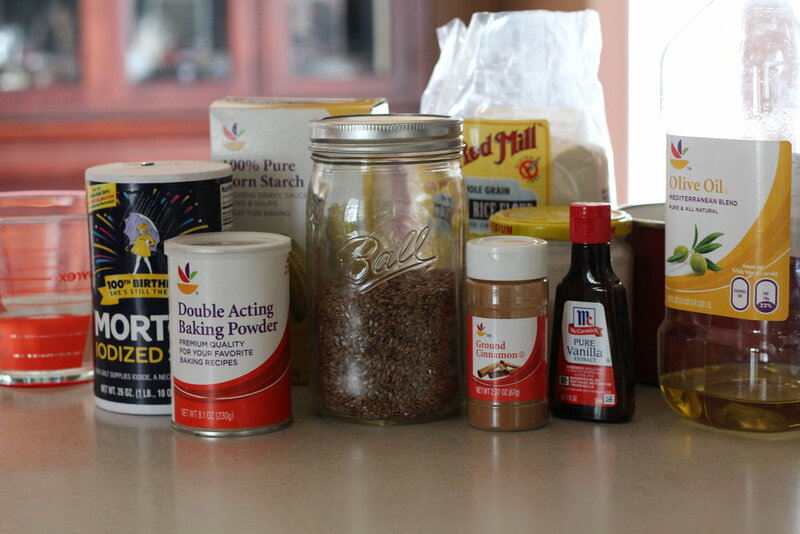 Add the flour, cocoa, baking soda, and salt; and mix only until the ingredients are combined. Stir in the peanut butter chips. 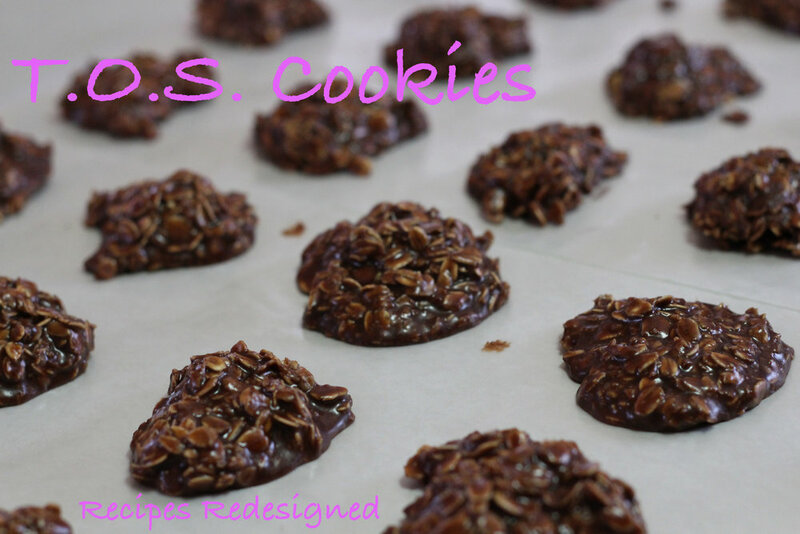 Drop by tablespoonfuls onto a cookie sheet. Bake for 8 minutes. Remove from oven and let cookies cool on the sheet for 2 minutes. Then move the cookies to racks to finish cooling. Store in an airtight container. *Let me know if you have any problems with this recipe and the gluten free baking mix that you used. I have found that I get varied results with the different GF baking mixes regardless what I bake. For this recipe, I used my own GF baking mix that I created. I am very excited about the mix that I came up with because I have had good success so far with whatever I make with it. I would like to do some more recipe testing with it before I tell you anymore about it. In the meantime, I would like to hear if you have good success or not with the baking mix or GF flour that you use.